Dress up your jeans all year long in these fashion leather boots with floral embroidery. A smooth leather back quarter accents our colorful footwear that begs to be worn day and night. The Ariat® Fleur performance boot offers timeless style, enduring comfort, and superior durability to keep you moving with confidence all day long. 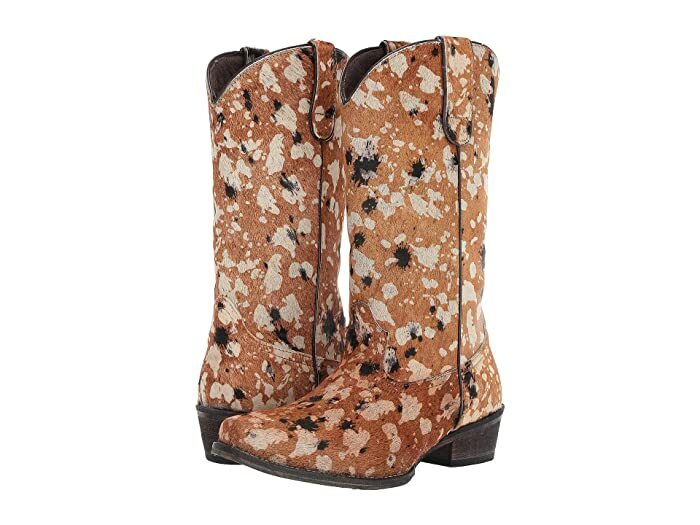 Cowgirl boot features an allover intricately embroidered floral pattern and embroidered arrows designs on collar. Pull-on boot with sturdy leather pull straps to provide easy on and off. Goodyear® leather welt for long-lasting durability and flexibility. 4LR® technology features a comfort insole with shock-absorbing rebound protection and a lightweight shank that stabilizes and adds support. Futurity leather heel with rubber heel cap. Distressed leather outsole with color-staining and scouring detailing for added style and stability. 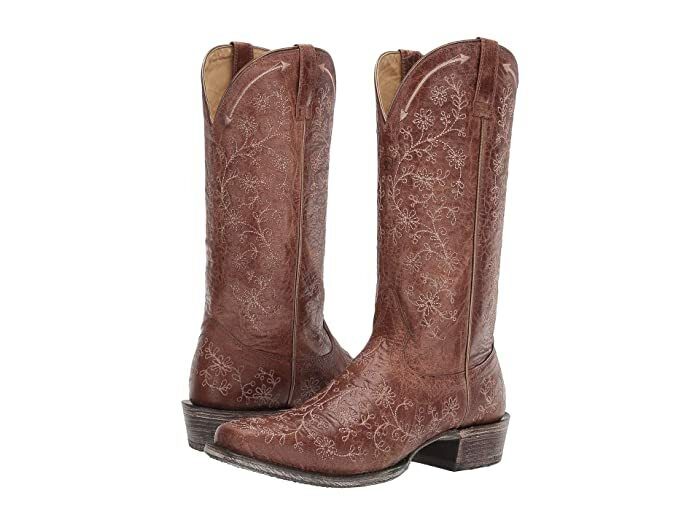 The authentic Western style and comfortable interior fit of the Roper™ Sussanah boot is ideal for the modern cowgirl. This style is made with natural cow hide that has been dyed. Fur origin: India. 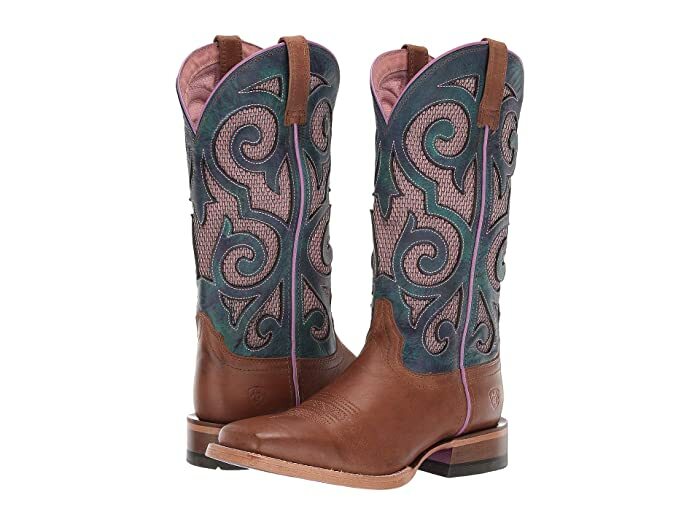 Pull-on cowgirl boot with sturdy pull loops. Soft man-made lining for a more comfortable feel. Cushioned textile footbed for total comfort. Snip toe with single-stitched welt. Range-treading comfort meets timeless Western style in the Ariat® Montage boots. 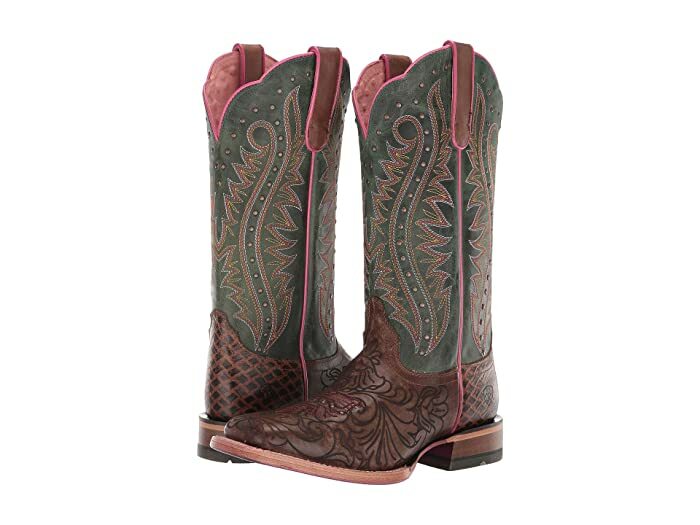 Western boots feature a full grain leather foot and shaft that is embroidered and studded for a stylish finish. Cushioned footbed features ATS® Pro Technology that provides advanced flexibility and cushioning with its shock-absorbing gel forefoot cushion, moisture-wicking lining, and ergonomic composite forked shank that also enhances stability. Leather-stacked cowboy heel with a slight spur ridge. 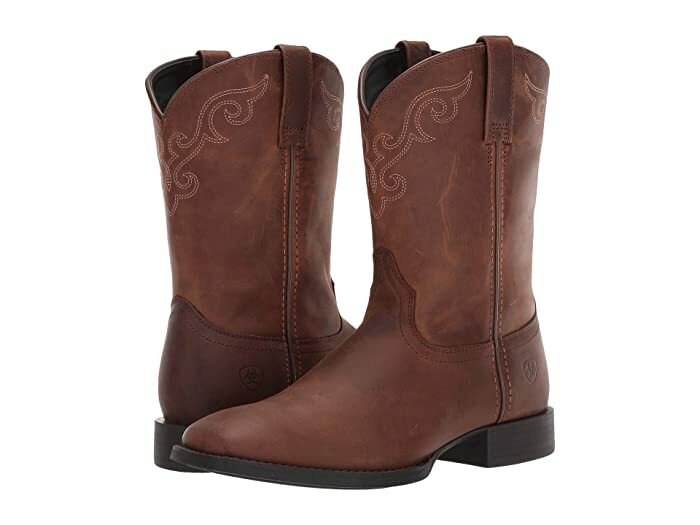 The clean, classic style of the Ariat® Roper Wide Square Toe boot completes your Western look! Features delicate stitching detail on shaft. Pull-on construction with leather pull straps for easy entry. The eye-catching style, lightweight comfort, easy flexibility, and reliable outsole stability of the Ariat® Baja Venttek boot will fit perfectly into your cowgirl look. 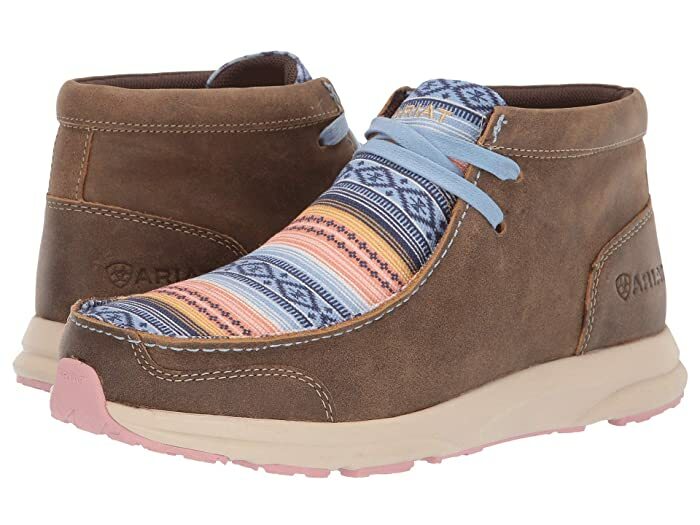 Full grain leather upper with intricate leather cut-outs and vented mesh panels for breathability. VentTEK™ technology in shaft area combines leather with cooling mesh panels for incredible comfort. Pull-on boot with two leather pull straps for easy entry. Cushioned footbed with ATS® PRO Technology provides superior flexibility and cushioning with its shock-absorbing gel forefoot cushion, moisture-wicking lining, and ergonomic composite forked shank that enhances stability. Hand-nailed veg-tan leather outsole with a color-stained finish. Choice of TAN/TURQUOISE or MULTICOLOR SERAPE STRIPE. 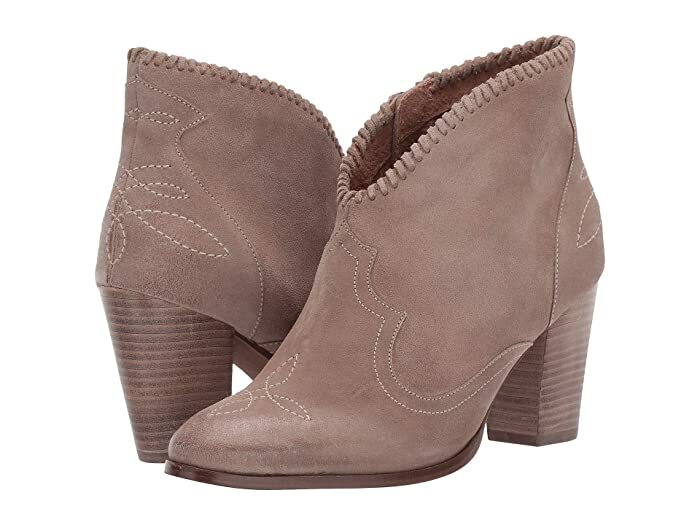 You will love the show-stopping style of the Ariat® Unbridled Eva bootie! Low-cut Western-inspired bootie with whipstitching and wingtip detail. Medial zipper entry for easy on and off. Lightweight PVC outsole with stacked heel. Choice of SAND (as pictured) or DISTRESSED TAN.